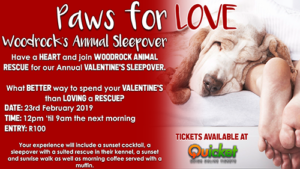 Have a heart and join Woodrock Animal Rescue for our Annual Valentine’s Sleepover. What better way to spend your Valentine’s than loving a rescue? We are so excited to have 100 of our awesome adventurous supporters spend a night sleeping in our kennel rooms, cuddling with our rescue dogs. The goal is to have an adventure, love and pamper our dogs and to raise funds towards our cause. STEP 1 – R100 UPFRONT REGISTRATION FEE: This is payable upfront to reserve your spot. This is non-refundable. Purchase your tickets via the Woodrock Quicket platform. STEP 2 – COME ALONG AND ENJOY! Arrive from 12 midday Saturday 23rd of February 2019. Sleepover. Leave at 9am Sunday 24th February 2019. If you have any questions you are welcome to email [email protected] or Contact Shevaughn on 060 506 1830 or Karin 0826827262. We are so excited for this event.